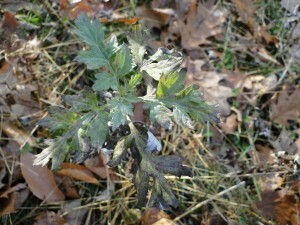 Mugwort or wild chrysanthemum (Artemisia vulgaris) has reached two unfortunate milestones: it has been added to the official, confirmed invasive species list of Connecticut, and it has started producing fertile seeds! It used to spread only by rhizomes, via stray chunks of dirt carried by tires & equipment. (That is what the internet fact sheets say.) But no longer, per recent germination tests by Jeff Ward, a scientist at the New Haven campus of the Connecticut Agricultural Experiment Station. Mugwort was probably an obligate out-crosser, needing to be pollinated by another genetically different individual. Over the past few decades, populations have grown and spread, mostly along roads and in construction sites. Mugwort may have evolved to be able to self-pollinate. Or it may simply be that more unrelated clones grow closer together, such that successful cross-pollination (by wind) has started happening more often. Mugwort is now “taking off.” Unless the herbal medicine entrepreneurs start harvesting in quantity! It does look rather like a chrysanthemum. As a young gardener I made that error, and let several grow through the summer. But the flowers were tiny and totally nondescript, not lovely mums! In winter mugwort stands are dull, even, light brown, and they usually cover large areas. Patches spring up on bare soil, left idle and unplanted, unstabilized after road-widening, topsoil stripping, or whatever. 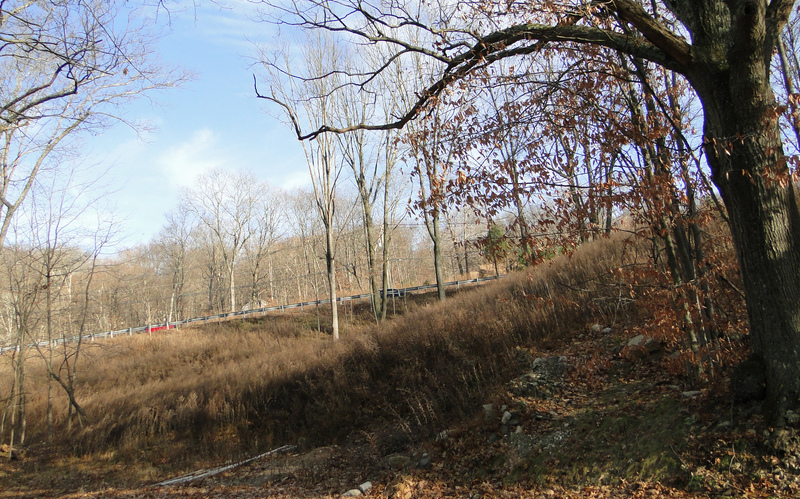 Incidentally, not stabilizing exposed soil at a work site, after active work has ceased, is counter to the 2000 Connecticut Erosion Control manual. If the road crew would only spread a few bales of mulch, preferably non-weed-free cuttings from a local meadow. One cannot rationalize that at least the wildlife value is high. Flowers are pollinated by wind, not bees or butterflies. Mugwort seeds are so tiny that the effort of finding and eating them would be greater for a songbird or vole than the calories gained. Most of the seed is its pale flying scale, irregular and variably shaped. A potent aroma will strike you as you walk though a mugwort patch in November, and crunch up some crisp leaves and seed heads – I imagine it smells like a busy apothecary in the 19th century. It was used to repel moths in wool closets. Powdered dried mugwort is still fed to sheep and goats, to prevent and treat parasites. Mugwort is sold on the internet to treat various human ailments. Sheep farmers beware! Toxic overdose is possible, as plants vary widely in active ingredient concentrations. On the other hand, if you can determine the approximate potency of your local Artemisia vulgaris, using it to control parasites will help help you get a better price for meat and wool, as “certified organic”. 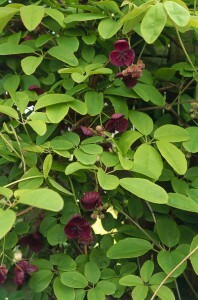 In contrast to mugwort, chocolate vine (Akebia quinata ) could hardly be more appealing, even has a fragrance of chocolate. It it is a special, uncommon ornamental that has NOT yet reached the stage of fertile seeds, though it sometimes escapes and smothers an acre or two of woods. At a challenging restoration site in the wealthy town of Wilton, Connecticut the diameter of Akebia patch diameter increased from 10′ to 40′ in two years, and the vine has now climbed at least 15′ up 8 trees and saplings. It used to be a an uncommon, fancy horticultural specialty, but is now sold over the internet (catalogue is source of photo) with alluring pictures. Construction equipment and roadside disturbance were the major players in the initial build-up of mugwort. If Akebia becomes a “kudzu of the north”, its intrinsic beauty will be responsible. I fear the “fertile seeds ” milestone may not be far away. For now we are grateful that Connecticut plants are sterile. I wish there were better research on the reproduction and dispersal of this – and other – apparently clonal invasives! Mugwort is wind pollinated, not insect pollinated. Maybe, before mugwort was so widespread, wind pollination was simply inefficient, assuming this is an “out-crossing” plant. 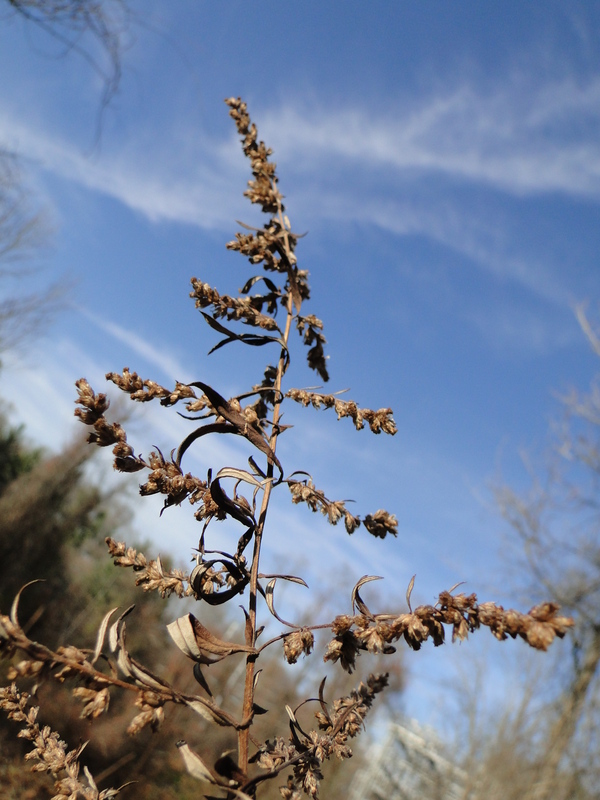 At least in this state with so many forested windbreaks, mugwort’s rudimentary flight rudder, many not have worked well to blow the seeds for multiple miles. I wish I were not just speculating. Proper research WAS done for purple loosestrife! With purple loosestrife, the reason for initial seed infertility in the northeastern US WAS rigorously studied. It was found that there were three mating -types (different genes), and plants had to mate with a different mating type for seeds to be fertile. For many decades this rarely happened, when the plant was just in widely scattered gardens. Finally a threshold of abundance and proximity was reached, and purple loose strife took off. Dr. Les Mehrhoff, the late UConn botanist was a pioneer in invasives investigations. In the last lecture I heard from Les, he warned that many species of widely scattered naturalized plants could, like purple loosestrife, also become aggressive invasives, if a certain threshold of abundance was reached. He mentioned Akebia quinata (chocolate vine) and Japanese spiraea (Spiraea japonica). With purple loosestrife, fortunately, over a decade of government funding supported research and release of a very effective , host-specific European biological control (Gallerucella leaf-eating beetles). The presence of this beetle at a site now determines whether this showy magenta plant becomes a dense infestation of f four to six -foot giants or a moderate height, and a not unwelcome part of a wetland community. The loosestrife leaves in an infested patch are riddled with holes and, for a few weeks in in early summer.are covered with tasty beetles (at least to to birds and tree frogs). I am concerned that the Galerucella beetles are no longer being adequately studied. Government funding is now much less available. One question: have a few especially fast-dispersing individuals parented most of the control beetle populations in Connecticut, such that there may be a genetic bottleneck, likely to lead to assorted genetic problems over time? The beetles were found to overwinter poorly in infestations along large rivers. Is purple loosestrife being adequately controlled in low floodplain meadows along the Connecticut River and in the Thames River drainage?